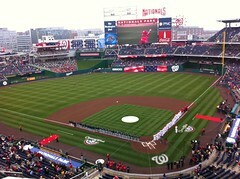 With weather more suited to the British Open than Opening Day, Nationals Park was still crowded with tens of thousands of fans to watch the team’s 2011 debut. Though coffee and hot chocolate were more likely than ice cold beer (so much so that the upper deck ran out before the game’s halfway mark), that hardly deterred the nearly sellout crowd. The Nats’ offense was just as cold as the stands, though, as they failed to do string together much of anything against the Braves’ Derek Lowe. Lowe kept the Nationals in check, surrendering just three hits in 5 2/3 innings, striking out six and walking just two. The Nationals had two solid chances with runners in scoring position against Lowe. Jayson Werth (1-4) singled in the first, and went to third on a looping single from Ryan Zimmerman(1-3, BB), a dividend of the Nationals’ speed upgrade and the coaching of Bo Porter. Lowe buckled down and retired LaRoche (1-4) and Morse (0-4) and ended that threat. Livan Hernandez has a strong outing, going 6 1/3 IP on 77 pitches, and gave up a pair of runs to the Braves. They struck in the first with a double by Chipper Jones (2-4, R, 2B), who scored on a single by Brian McCann (2-4, RBI, 2H) to right which saw Werth call off the becannoned Rick Ankiel for the throw, which surprised me. Werth’s throw was offline and Jones scored easily. Jason Heyward (1-2, HR, BB) drilled a 2-1 pitch to the right field wall to start the 2nd, but that was the end of the Braves offense. After that home run, Hernandez would send down 15 straight Braves before giving up a single to McCann to start the 7th. It’s hard to disagree. Moylan, Venters and Kimbrel shut the Nationals down by the numbers, retiring seven Nats in a row to end the game, including the core of the Nats’ order. One questionable moment came in the bottom of the 7th, when the Nats burned Jerry Hairston Jr to put Laynce Nix (0-1, K) up against the righty Peter Moylan. The question came loud and clear from many press box twitter feeds: “Laynce Nix up vs. righty with tying run on. Why is Matt Stairs on the team if he’s not hitting here?” A fine question indeed, one that Adam Kilgore asked Riggleman during the postgame. “It was a tough call. I felt if I put [Matt] Stairs u there, they wouldn’t let him hit.” Riggleman was convinced that the only chance for a real hit there was from Nix, and while he had opportunities, he was fooled by the offspeed stuff and swung well ahead to strike out. The Nats take Friday off before a pair of day games Saturday (1:05pm, Exxon Magnet Schedule day) and Sunday (1:35, Kids Run The Bases) against Atlanta as part of their opening series.